Istituto Svizzero is pleased to present “Chaussures italiennes”, the first solo presentation in Italy by artist Sylvie Fleury. Fleury’s technique consists of an initial portrayal of a characteristic form that is then enriched, enlarged, and further developed through the use of diverse media. Form, colour, and the graphic shaping of shoes, lipsticks, shopping carts, or fashion magazines become independent visual systems of representation in their own right, entering a new aesthetic scope. With a particular relationship to space, a clever sense of staging, a displacement of signs and objects, a divergence of codes, perspectives or lifestyles, and a strong existence of the body between presence, loss and withdrawal: Sylvie Fleury’s work constantly blurs and reinvents our relationships with works of art. By blurring the lines between art and fashion her intent is not to open up the realm of art to that of fashion, rather it’s to point out the difference between the two: one cannot have an aesthetic experience by looking at fashion. Objects, such as art, bring into play the intellect and, at the same time, invite us to reflect on what the cognitive process of understanding itself means. In such sense, Fleury’s works are not an appropriation rather a customisation, in the way that there is something more taking place: “[…] nowadays the readymade has become such an open road for artists. There are so many different ways to create a readymade”, in the artist’s words. The title of the exhibition is connected, but not limited, to an important work entitled Retrospective: a shoe cabinet, where the artist has stacked her most extravagant high heels worn during her openings or performances and condenses part of the concept behind the exhibition. 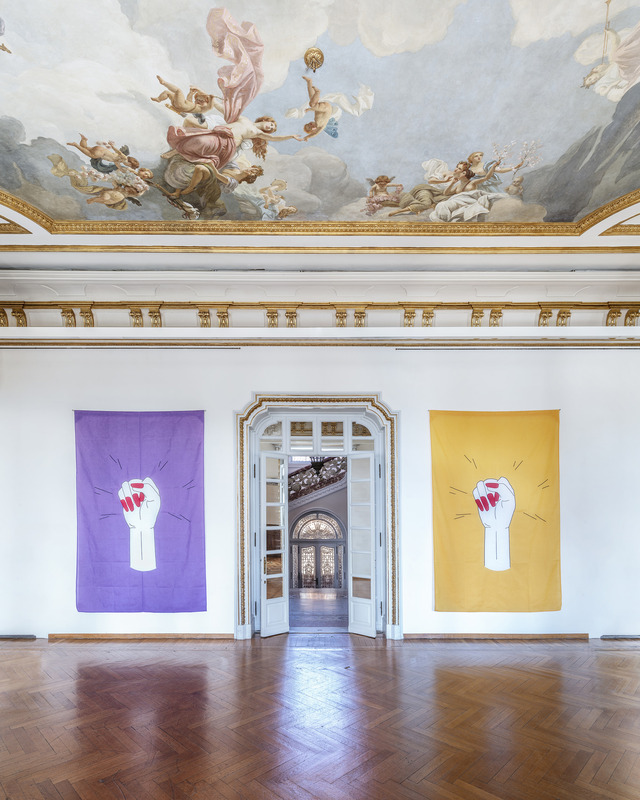 For her solo presentation in Rome, Sylvie Fleury will dominate Villa Maraini’s exhibition rooms, until June, with Retrospective and other works from different times of her prolific production: pieces specially produced for the exhibition along with some of her most iconic ones. It will also be a chance for the public to view her work Miracle: a giant purple neon installed at the Villa in 2016, which has shined and thrilled the Roman public for three years. Sylvie Fleury was born in 1961 in Geneva, where she lives and works. She has held solo exhibitions at international art institutions since the early 1990s, including the Neue Galerie am Landesmuseum, Graz (1993); Le Consortium, Dijon (1994); the MAMCO, Geneva (1996 and 2008); the Migros Museum für Gegenwartskunst, Zurich (1998); the Kunstmuseum Sankt Gallen (2000); the Museum für Neue Kunst/ZKM, Karlsruhe (2001); Le Magasin, Grenoble (2001); and the CAC Málaga (2011), the Bass Art Museum, Miami (2016). She has been included in many group exhibitions worldwide and participated in “Aperto” at the Venice Biennale in 1993 and the São Paulo Biennale in 1998. Her work is included in public collections such as The Museum of Modern Art, New York; the ZKM Center for Art and Media, Karlsruhe; Daimler Contemporary, Berlin; the Migros Museum für Gegenwartskunst, Zurich; the MAMCO, Geneva; and the Museum of Applied Arts/Contemporary Art, Vienna, the Bass Art Museum, Miami. Sylvie Fleury was recipient in 2018 of the prestigious Swiss Meret Oppenheim award.